Hand crafted soup bowls are included in the ticket price of Soup Bowls for Hunger, benefitting local food shelves. Thursday, March 26 at 5 p.m. — RUTLAND — The ninth annual Soup Bowls for Hunger will be held on Thursday, March 26 in the Rutland High School Cafeteria. Tickets are $15 which includes soup, roll, dessert, beverage, a hand crafted soup bowl and entertainment. There will be three sittings at 5 p.m., 6 p.m. and 7 p.m. Tickets must be purchased in advance at Rutland High School. All proceeds will be donated to the Community Cupboard and other local food shelves. Soup Bowls for Hunger is being coordinated for the fifth year by members of the local Delta Kappa Gamma Society, an international society for women educators. 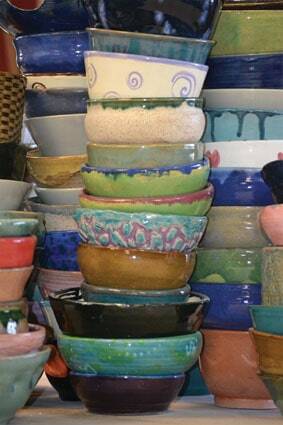 “The event is truly a community effort,” said chairperson, Lynn Del Bianco Hier, with over 200 bowls made by RHS Creative Structures teacher Darren Spafford, and students from Rutland and Otter Valley Union High Schools and Green Mountain College. The rest of the bowls are donated by professional potters from Rutland County, western New York and Connecticut. Rolls are made by Stafford Tech students and desserts by Rutland High’s “Real Meals” classes. Entertainment will be provided by RHS choral director Dan Graves. Raffle tickets will also be available for numerous donated items. Soups have been donated by Café Provence, Castleton State College, CSC Golf Team, East Creek Catering, Harvest Moon Café & Bake House, Holiday Inn, Killington Avenue Market and Deli, Panera, Rutland Regional Medical Center, Sodexo, Table 24 and Terrill Street Market. Last year’s event raised $12,750 for local food shelves. For questions about the event or to purchase tickets, visit the Soup Bowls for Hunger event page on Facebook or call Ann Bannister at 802-747-0569, Rutland High School at 802-773-1955 or Lynn Del Bianco Hier at 802-770-1113. Tickets went on sale March 2.